Undeniably the most unique primate that survives in the forgotten forests of Africa is the gorilla, both the mountain gorilla and the lowland gorilla. 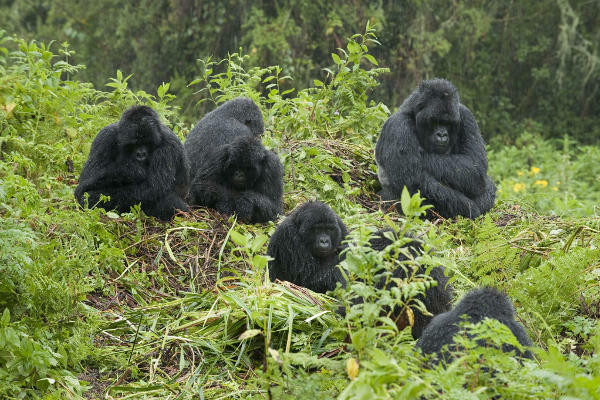 In contrast to the six billion human beings living on our crowded planet there are only some seven hundred mountain gorillas left on the borders of Uganda, Rwanda and Congo. Either go gorilla trekking again – additional permits required, subject to availability- or opt for one of the other, gentler but equally rewarding alternatives available. The Buhoma Village Tourist Walk opened in Dec 2012, and was designed by MBIFCT, in collaboration with Uganda Wildlife Authority, to increase the variety of tourism activities offered at Bwindi National Park and to provide members of the local community with an alternative source of direct income linked to conservation. The Village Walk is a concrete example of a community-based tourism enterprise where local people have participated in the design of its activities, invested resources in its development and benefit from its returns. At the same time, the local people have an incentive to conserve the natural and cultural resources on which income generation depends. The safari lodge overlooks the primeval Bwindi forest home to gorillas, monkeys, chimpanzees and birds. Tracking gorillas in the so-called ‘impenetrable’ forest is a magical experience. At this stunning eco-lodge with eight bandas, clients can spend the day on the terrace, which juts out into the forest, mesmerized by its exotic sounds watching primates and birds in the canopy. The walk to the river through regenerated bush we have carefully nurtured as a buffer zone is magical. It is a favourite haunt for the gorillas and they often sleep at the lodge!